This substantial pie will fill up even the hungriest of people, and it looks pretty, too. The phyllo is intimidating at first, but then you just smother it in butter and know that everything is going to be OK.
8 ounce package phyllo, thawed (I used an entire 16 oz package, but a lot gets trimmed off the edges at the end. 1. Steam greens for 3-4 minutes, until they turn a bright green. Drain, and set aside to cool. Carsely chop once they are cool enough to handle. 2. In a large skillet, heat oil over medium-high heat. Add the onions, cook until browned around the edges, 3-4 minutes. 3. Add mushrooms and season with salt and pepper. Increase heat and cook, stirring until mushrooms caramelize, about 5 minutes. 4. Stir in greens and sun-dried tomatoes. Remove from heat. 1. Mash the tofu in a bowl. 2. Add rest of ingredients, stir until combined and set aside. 1. Brush a 10 inch spring form pan or pie dish with butter. Place 5 sheets of phyllo down, brushing with butter between each layer. The extra pieces that hang over can be trimmed off at the end, or folded over. 2. 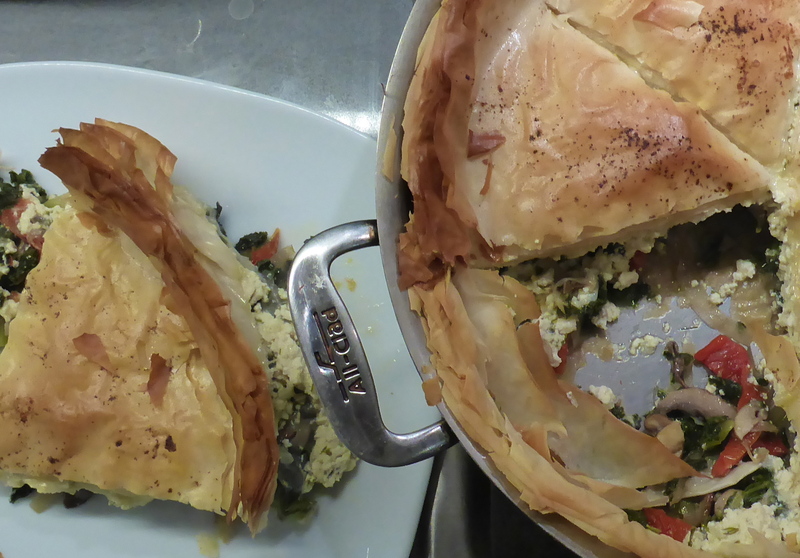 Spread the vegetable layer, and cover with 2 more phyllo sheets, buttered in between. 3. 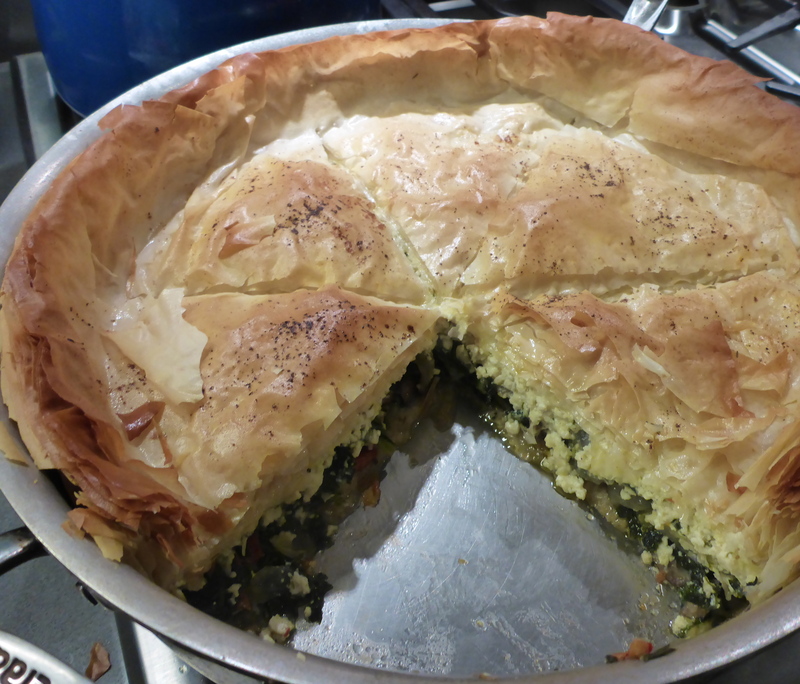 Spread the tofu layer and top with 8-10 more phyllo layers, again, brushing with butter between each layer. 4. Brush top with butter. Lightly score top into 6 slices, taking care to only cut phyllo layer. Sprinkle with paprika. 5. Bake until browned, about 35 minutes. Let cool for 5 minutes before serving. Sooooo happy to receive a recipe from you in my inbox! I’ve totally lost all motivation / interest to cook since tending to a one year old! Ha! Crazy! Would love to see you one of these days!! I’m actually teaching a yoga class in Your neighborhood at Prema Yoga tomorrow at 7:00. More soon!